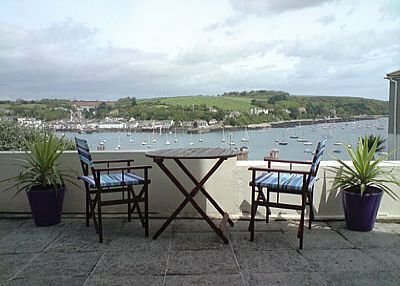 Welcome to our stunning holiday bolthole with incredible, panoramic views across Falmouth bay..
No 8 Estuary View is the ground floor 2 bedroom flat of a beautiful, listed period building in a great location for the town centre minutes away from all the action, restaurants, maritime museum, bars and beaches. The property has been refurbished to a very high standard, contemporary and yet cosy with fastidious attention to detail. Light and airy with a seaside atmosphere this is beach chic at its best ! Smoking not permitted inside but is ok on the patio. Small dogs welcome but a payment of £15 per week per dog is required. Linen, towels, games, books and local information supplied. Huge master bedroom super king size bed, built in wardrobe and stunning views. Nautical themed second bedroom with one double and a single bed. Spacious living area with French doors opening onto a large patio. Fully fitted, brand new kitchen diner with all modern appliances. Falmouth’s natural harbour is the third deepest in the world and provides a picturesque background to the resort, a focal point for many water sports and the National Maritime Museum. Many of the harbour side shops, cafes and restaurants have unsurpassed views across the water to Flushing , Falmouth Bay and beyond. Falmouth’s main street has a charming mix of shops for gifts, clothes and antiques just head down the road and swing a right into town. A wonderful fusion of chic and style. The food is prepared in the open kitchen by a wonderful team of Chefs all being specialists in their own fields. (Amazing steaks!) This together with the wonderful location on the Marina side means its just a perfect place to sit and enjoy all Harveys has to offer. With FANTASTIC 180 DEGREE VIEWS over the harbour, the Star & Garter is Falmouth's premier gastro-pub. A traditional Cornish freehouse, but with a twist ! Following on from his sucess in Padstow, Rick Stein has recently opened in Falmouth, Get some takeaway fish and chips and sit on the harbour, taking in the views. Literally opposite Estuary View, the pub with the views, Great local food, Cosy relaxed atmosphere, board games, Kids and dogs welcome and the best bit only yards from your door. GYLLYNGVASE Cliff Road, This is the main town beach and a beautiful, long sandy stretch. Calm waters most of the time, excellent facilities for kids and a very cool café. CASTLE BEACH also on Cliff Road, this smaller beach is not as busy, has excellent rock pools and a good but basic café. Walking or driving along the coast (beautiful walk) from the above beaches will lead you to SWANPOOL and MAENPORTH beaches. These are both lovely sandy with cafes and stunning views over to the headlands. Swanpool also has a nature reserve with a lake for boats and swans. Gylly Beach - 5 mins away, on Gyllngvase Beach, locally sourced food in a friendly and relaxed atmosphere, over looked by Pendennis castle with fantastic views of the lizard peninsula. Seasonal, local & freshly prepared food served daily from 10 am Live Bands at weekends. Huge Outside terraces with epic sunsets. "The original beach bar-brasserie..."
One of our regular haunts, right on the beach, cant beat a sunday carvery, followed by a walk on the beach. Right in the middle of Perranporth beach, great food, sunday carvery. 2 Bedrooms, one master with a superking size bed, and a 2nd bedroom with a double and a single bed.